Other number I6276 On one of the pieces. Other number I6333 On one of the pieces. The object consists of two pieces. 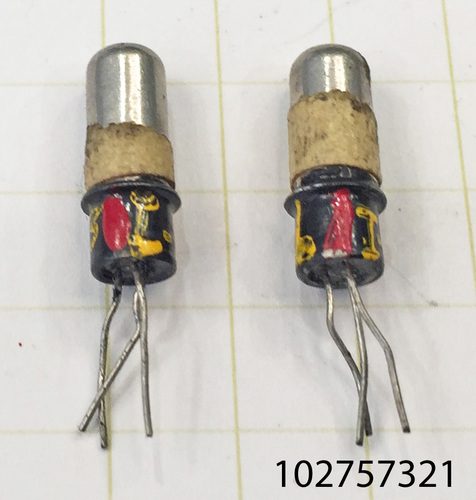 "Philco Surface Barrier Transistor (3 pieces), germanium PNP surface barrier transistors. Early 1950s. Philco was one of several large mid-century electronics firms that moved quickly into the newly evolving world of germanium transistor technology – other successful companies of similar market presence included GE, Raytheon, RCA, and Sylvania. Philco’s major and most successful transistor product line began with the SBT (Surface Barrier Transistor) which used a unique precision etch manufacturing process to produce very high frequency switching and RF devices. These first SBTs were developed by Philco in the early 1950s under a U.S. Army Signal Corps contract. A unique aspect of these Philco early SBTs was the use of a proprietary “bullet-shaped” metal case, later defined as JEDEC TO-24, which was a successful Philco implementation of a hermetically sealed case. Continued improvements to the precision etch process by Philco supported the rapid development of new higher performance types, including the MAT (Micro Alloy Transistor) and the MADT (Micro Alloy Diffused-base Transistor). These high speed devices were ideally suited for military and commercial applications, including computers, satellites and RF equipment, and were sold in the millions throughout the 1950s. Rare – the SBTs in this lot are hand serialized and not stamped with production type numbers. These are early production devices, likely from 1952/53, and represent some of the earliest SBTs available."